Your calendar is where you land when you login to Mintent. It is where you can see all your content for the current month in one place. You can add and save filters for quick access, and move items around as necessary. 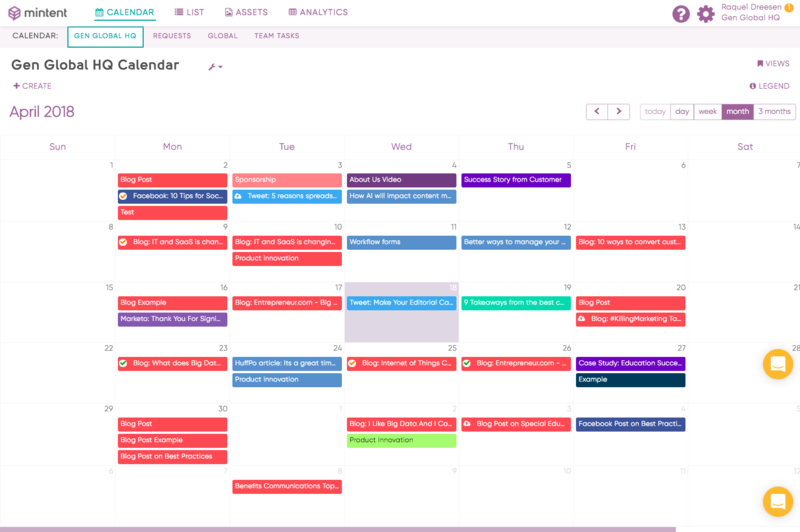 When managing the distribution of your content strategy, the editorial calendar gives you seamless ability to organize your efforts and meet your deadlines. If click on the Month and Year (January 2018, highlighted in blue), you can easily navigate to different dates. If you click on the two arrows (highlighted in purple), you can go back and forward in calendar months. If you click on the Today, Day, Week, Month, and 3 Months option you have the ability to see the calendar in a daily, weekly, monthly, and quarterly view. To view your calendar in list form, read this quick guide.